thx for sharing,walk-chan,this is really nice!! That's a nice looking scene.... don't know what's going on, but it looks nice anyway! Love the watercolour effect as always! I don't even really know this series all that much and I can safely say, by looking at images, that I really want to know more about it. I really like this image. +favorite! wow! 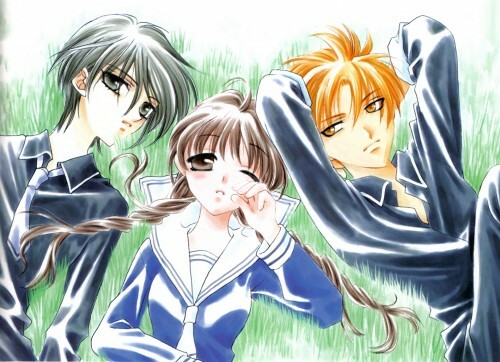 the scan is sooo cute i like the drawing especially Kyo hes sooo cute here and tohru to! i love this pic! there's so much contrast, it looks so cool. 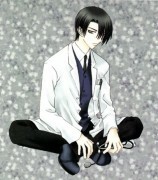 i heart kyo. ^_^ thanks for posting this scan! truly, a very nice art boo ^-^ and thank you so much for doing this scan for all of us ^o^ makes me happy to see that there are still real scan people out there ^_^, and by the way, fav!!!! good picture! I like it. it's feeling well. its so cute add to favourite!!!!!!! Kyo looks so handsome!!!!! keep up the goodies!!! wow what a pretty one i really like the cool spirng one its veryy pretty keep up the good work! Wow... nice lighting and just a perfect Fruits Basket scan. Thanks for sharing!! What a great position to be in. Very cool pic. awwww....that's probably my favourite furuba picture out there....tanks. Look at how thin is Yuki!